It does conclude with a vote about the next direction to take. So it’s a good chance for people who like to see authors twisting to their audience’s demands. Mort Walker and Dik Browne’s Hi and Lois for the 23rd of May, 1961 builds off a major use of arithmetic. Budgeting doesn’t get much attention from mathematicians. I suppose it seems to us like all the basic problems are solved: adding? Subtracting? Multiplication? All familiar things. Especially now with decimal currency. There are great unsolved problems in mathematics, but they get into specialized areas of financial mathematics and just don’t matter for ordinary household budgeting. Mort Walker and Dik Browne’s Hi and Lois for the 23rd of May, 1961 and rerun the 19th of November, 2018. Essays that mention topics raised by Hi and Lois , both current-run and vintage, should be at this link. Hi comes across a bit harsh here. I’m going to suppose he was taken so by surprise by Lois’s problem that he spoke without thinking. Scott Hilburn’s The Argyle Sweater for the 19th is the anthropomorphic numerals strip for the week. With the title of “improper fractions” it’s wordplay on the common meaning for a mathematical term. Two times over, come to it. That negative refers to a class of numbers as well as disapproval of something is ordinary enough. I’ve mentioned it, I estimate, 840 times this month alone. Scott Hilburn’s The Argyle Sweater for the 19th of November, 2018. The many essays with mention of The Argyle Sweater will be at this link. Jokes about the technical and common meanings of “improper” are rarer. In a proper fraction, the numerator is a smaller number than the denominator. In an improper fraction, we don’t count on that. I remember a modest bit of time in elementary and middle school working on converting improper fractions into mixed fractions — a whole number plus a proper fraction. And also don’t remember anyone caring about that after calculus. In most arithmetic work, there’s not much that’s easier about “1 + 1/2” than about “3/2”. The one major convenience “1 + 1/2” has is that it’s easy to tell at a glance how big the number is. It’s not mysterious how big a number 3/2 is, but that’s because of long familiarity. If I asked you whether 54/17 or 46/13 was the larger number, you’d be fairly stumped and maybe cranky. So there’s not much reason to worry about improper fractions while you’re doing work. For the final presentation of an answer, proper or mixed fractions may well be better. Whoever colored that minus symbol before the 5 screwed up and confused the joke. Syndicated cartoonists give precise coloring instructions for Sunday strips. But many of them don’t, or aren’t able to, give coloring instructions for weekday strips like this. And mistakes like that are the unfortunate result. Pascal Wyse and Joe Berger’s Berger and Wyse for the 19th of November, 2018. Essays that bring up topics raised by Berger and Wyse will be this link.. It’s a new tag, though. Pascal Wyse and Joe Berger’s Berger and Wyse for the 19th features a sudoku appearance. 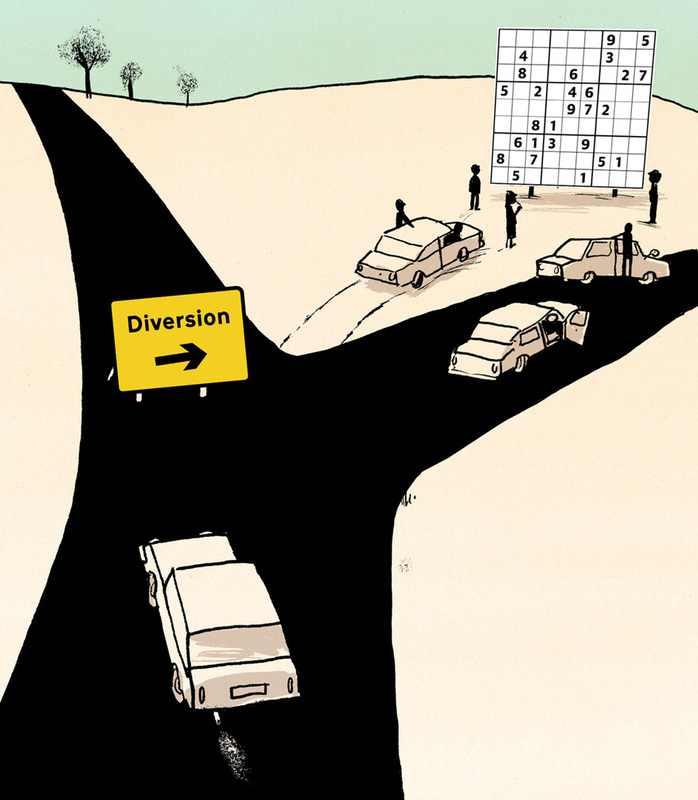 It’s labelled a diversion, and so it is, as many mathematics and logic puzzles will be. The lone commenter at GoComics claims to have solved the puzzle, so I will suppose they’re being honest about this. Brian Fies’s Mom’s Cancer for the 19th of November, 2018. The handful of essays inspired by Mom’s Cancer are at this link. Brian Fies’s Mom’s Cancer for the 19th I have mentioned before, although not since I started including images for all mentioned comics. It’s set a moment when treatment for Mom’s cancer has been declared a great success. The trouble is, as Feis lays out, volume is three-dimensional. We are pretty good at measuring the length, or at least the greatest width of something. You might call that the “characteristic length”. A linear dimension. But volume scales as the cube of this characteristic length. And the sad thing is that 0.8 times 0.8 times 0.8 is, roughly, 0.5. This means that the characteristic length dropping by 20% drops the volume by 50%. Or, as Feis is disappointed to see in this strip and its successor, the great news of a 50% reduction in the turmor’s mass is that it’s just 20% less big in every direction. It doesn’t look like enough. Bill Holbrook’s On The Fastrack for the 20th of November, 2018. This and other essays inspired by On The Fastrack are at this link. Bill Holbrook’s On The Fastrack for the 20th presents one of Fi’s seminars about why mathematics is a good thing. The offscreen student’s question about why one should learn mathematics goes unanswered. As often happens the question is presented as though it’s too absurd to deserve answering. The questioner is conflating “mathematics” with “calculating arithmetic”, yes. And a computer will be better at these calculations. A related question, sometimes asked (and rarely on-topic for my essays here), is why one needs to learn any specific facts when a computer is so much better at finding them. Knowing facts is not understanding them, no. But it is hard to understand a thing without knowing facts. More, without loving the knowing of facts. If we don’t need to be good at calculating, we do still need to know what to have calculated. And why to calculate that instead of something else. In calculating we can learn things of great beauty. And some of us do go on to mathematics which cannot be calculated. There is software that will do very well at computing, say, the indefinite integral of functions. I don’t know of any that will even start on a problem like “find the kernel of this ring”. But these are problems we see, and think interesting, because our experience in arithmetic trains us to notice them. Perhaps there is new interesting mathematics that we would notice if we didn’t have preconceptions set by times tables and long division. But it is hard to believe that we can’t find it because we’re not ignorant enough. I wouldn’t risk it. This and more Reading the Comics posts should all be at this link. And for the rest of the calendar year my Fall 2018 Mathematics A To Z should continue posting new essays. I’m still looking for topics for the last half-dozen letters of the alphabet. Give your mathematics term a try.